Accory offers a full line of cable tie accessories to help the cable ties securing the wires and cable firmly under all sorts of conditions. 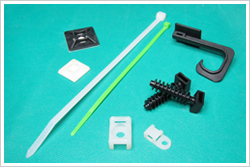 The accessories include cable tie mounts, cable tie clips, cable tie holers, etc. These small self-adhesive squares are ideal for securing and tidying up the wiring in your case. Simply loop the cable tie through the top opening and secure the mount to your case using the self-adhesive backing or a screw. The Screw Tie Mount is designed to provide stability to wire bundles. These mounts can accommodated miniature, intermediate, or standard cross-section cable ties. Each mount is secured with a single screw. These fixings have been designed to hold and secure cable ties to brick, concrete or wood. Cable tie hook is a flat strap plastic hook with a cable tie through hole.